Have you wondered how to take gorgeous photos of your cards and projects? Well, wonder no more. Today we have a fun tutorial for you on how to make a light box using cardstock. 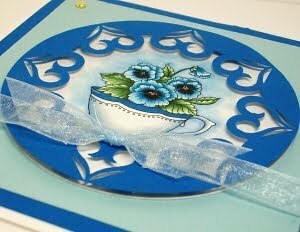 The tutorial was prepared by Debra and may also be found on her blog, Creative Heart Designs. Thank you, Debra, for sharing this wonderful tutorial with all of us! I finally found a way to photograph my cards that I am happy with. You probably have the supplies for making the backdrop in your card stock supply. Take 3 sheets of heavyweight white card stock (8-1/2" x 11") and lay them out as shown. Arrange the sheets with one 8-1/2" x 11" sheet on each side then turn your third piece (with the 11" side at the bottom) for the center...lining up at the top. Tape the three pieces together using clear tape. Score and fold the bottom of the two outer sheets (lining up your folds with the bottom of the 11" x 8-1/2" center piece). Fold in the side pieces and arrange in a box shape as shown below. 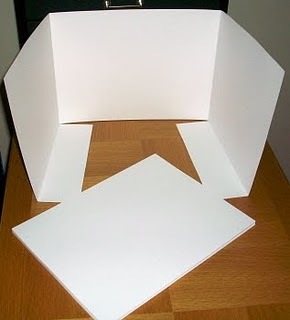 For the bottom (floor) of your light studio, place a few pieces of card stock on the folded pieces to hold the box shape and your backdrop is done. Next, add your light source (I highly recommend an Ott Lite) placed above and to the front to illuminate your card. Move it as necessary to lessen the shadows. If you don't have a light source, use your flash. Put the card in the light studio and take your photo (with or without flash). A tripod isn't really necessary, but my husband thought I needed one, so I use it occasionally. All of the recent card photos on my blog, Creative Heart Designs, were taken this way...without flash. 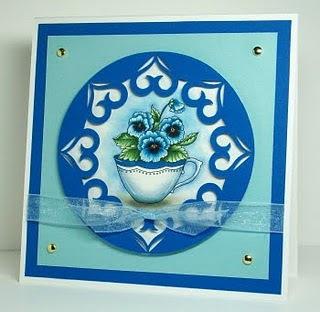 Here is a close up of the beautiful Teacup Pansies card featured in Debra's Light Box. 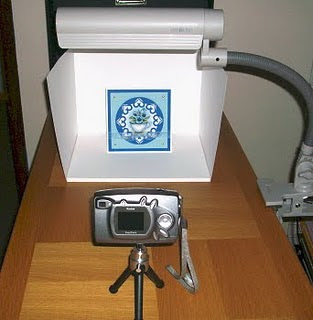 Do you use a light box to take photos of your cards and projects? Do you have tips or suggestions on ways to take better photos... i.e. a favorite light source, time of day to take your photos, etc. After you take the photo, do you edit the photo in any photo editing software? Please leave a comment at the end of this post to share your ideas! I am in need of a good light box, so thank you! How very timely! I was just complaining to my husband over the weekend that my card pics are always too dark. He gave me the OK to purchase a lightbox but I think I'll give this a try! Thanks!! I cheat with my "light box." My desk is between 2 white cabinets and has a white surface. The wall behind the desk is half white and half beige, so I put a piece of card stock up just until I get some white paint (haha, that was a year ago.) I put my card in one corner of the desk and my Ott Light is slightly in front of it. I can easily take a picture of cards or any 3D items as my space can be adjusted to size. It's a cheat, but works well. I edit my photos in Photo Shop Elements and add my watermark. I think that by making a few simple adjustments to the way the photos are taken and edited has made a big difference in getting my cards noticed. Thank you so much! I really want to take better pictures but had no idea how to do one of these! Thank you!! I purchased one of the little tri-fold project boards. The middle section is 12x18. I put lots of repositional adhesive on the middle part so I can change the background color. I put a 12x12 sheet on the board and another on the table. Wow, this is great. I usually just put a couple pieces of cs behind and under my card and hope I don't get anything else in the pic. I have been trying to think of a way to create one of these. Thanks for sharing this tut. Thank you for the info. I made up something like this, but it only has 3 sides. And I wait for a sunny day. Which sometimes means I will be waiting a while. I don't have an Ott light, would a regular light work I wonder?? What a fabulous tutorial. I've been wanting an OTT light. I need more light in my craft space anyway. Many thanks for sharing this idea... I'm going to try it soon, as well as Dixie's idea of using a trifold board which is larger and would work to photograph bigger items, paintings, etc. Taking pictures was the biggest problem for me until i figured out u have to press the snap button in halfway and let it focus then take the pic-duh. I just use a white pillowcase behind my pic and they are best if done in daylight I notice-anyways if I had more room I could have something like this but I only have a small area the size of a closet for crafting. Thanks SO much for this! I have the exact same Ott-lite and the exact same camera! Weird, huh? I have too many handmade cards to send to my family and friends, so I'd like to donate them. Can you tell me where I would send them from the Kansas City, MO area? I'm not sure who to contact about this. Also, I'd love to feature someone's cards on my blog as I have a Featured Friday post every Friday. I'd like to help promote the program and ask for more donated cards to be sent. Visit me at http://vivaciousvavoom.blogspot.com and email or post a commet if you are interested in being featured on my blog. BRAVA DEBRA!!! what a wonderful little tool, thanks for the tutorial and sharing the beautiful card with us as well. I always scan my cards...doesn't really do them justice especially if they have anything lumpy on them.Thanks again. CONGRATS...I have Nominated you for the Kreativ Blogger award! check it out! Thanks SO much for posting this--I whipped up my handy-dandy light box this afternoon and it works wonderfully!! Best thing, it only cost me a couple of bucks and the pics I took look sooooo much better!! I can't thank you enough for posting this! Photography just isn't my forte, and even though I still need work on the "shadows" the lightbox has made a HUGE difference in my pics. Thank you thank you thank you! Thanks for this idea. Made mine today and then took some pictures of cards using a lamp that I had. Pictures turned out very pinkish. Will check out that ott light soon. Great blog. Great tips. Thanks. Thanks you so much for sharing this lovely idea with all of us.. Thank you so much! This is exactly what I'm looking for, and I love that I already have all the materials I need, without having to buy anything extra! What a fabulous tutorial! I've been wanting an OTT light. I need more light in my craft space anyway.